We live in Europe. It’s wonderful. We get to travel a lot, and see tons of things I never imagined being able to see. It’s also a little stressful because I am a native English speaker. I never learned another language, but really, one language wouldn’t do me much good here in Europe. I can drive 5 hours in any direction, and need to know a different language. The Schoolhouse Crew has come to my rescue this year, with a review of a new online language program that gives me access to over 60 languages for one price. Mango Languages (the creators of Mango library edition which you may have used in the past) has a new, extensive Mango Homeschool Edition made just for homeschooling families that has been perfect for my needs. 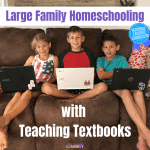 What is Mango Homeschool Edition? Mango Homeschool Edition is an online membership website that gives you access to over 60 languages. This means that each student can learn as many languages as they want, even concurrently. If you have a child who is learning French, Spanish and Latin, this one membership will work to teach all three of those languages. What’s really neat is that they have lessons for even some of the more obscure languages. If you want to learn Farsi, Icelandic, Pashto, or Thai, they have you covered, too. When you sign in to Mango Homeschool Edition, you can choose from the complete listing of courses (“communities), and add as many as you like to your schedule. Then, you can click on your course, and see the breakdown of lessons. 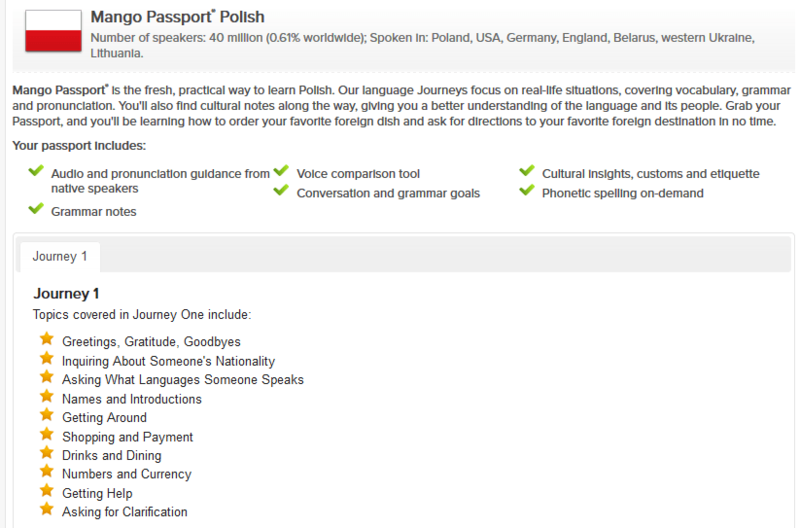 This is the homepage for Polish, since we’re getting ready to head to Warsaw in a month or two. For this language, there is one Journey, which covers everything I really *need* to know for a basic weekend visit to the country. Other languages, like Portuguese, have three Journeys, covering even more information, and some even include PDF files of the lessons that you can print off to help you learn offline. When you open the lesson itself, this is the interface you see. Each phrase is introduced slowly, one word at a time, and is built on as the program teaches you grammar and conversational rules a little bit at a time. 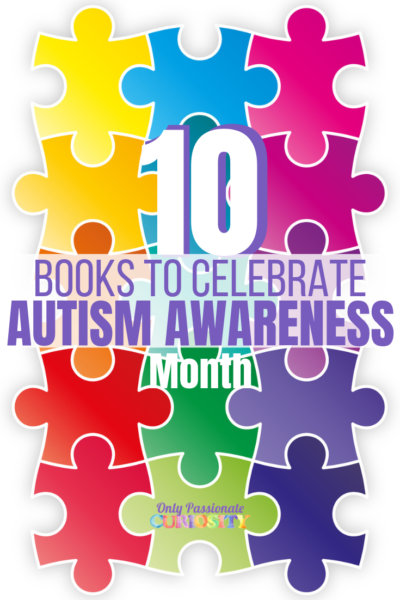 The program speaks the words to you clearly, and you repeat and answer questions until it’s easy to remember each tidbit, and before you know it, you can have a simple conversation! 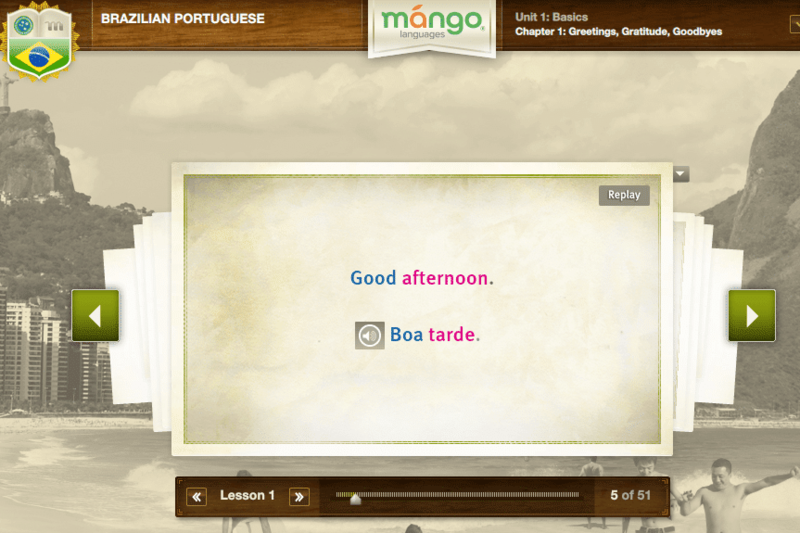 We have been using the beta version of Mango Homeschool Edition. Right now, the product is definitely “shelf-ready” without any glitches, or other complications, but as of right now, the program is mostly the lesson content only with little teacher interface. I’ve been told there are lots of exciting things coming soon to Mango, like printable quizzes and tests for tracking student progress, and the ability to track your student’s lesson usage from your teacher account. I’m going to be waiting and watching to see where Mango goes with their teacher interface, because these features are going to be wonderful for parents of Homeschooled Highschoolers. I used this program with the kids, and for myself. I really enjoyed it for myself, but I have to say, it wasn’t the perfect fit for my little kids. While this program is recommended for Homeschoolers of all ages (6 to Adult), I think that is probably better for kids 10 and older. There are a few social features, like the ability to chat, use forums, and email members within Mango that can not be restricted at this point, which is better suited for older children and adults. (we did not use the social features at all, and they were easily ignored by not clicking on those tabs). As far as the lessons go, my crew needs more multi-sensory interaction, and became bored quickly with the conversational format of these lessons. I tried to have them keep a notebook to add in some writing skills, but it just wasn’t a good fit for a young child who still thrives on songs, games, and “cutesy” materials. Mango Homeschool Edition is not a “cutesy” program. It’s serious language learning for serious students. As an adult, I loved the no-nonsense format that gave me all the vocabulary, cultural notes, and grammar I needed to hold a conversation quickly, and efficiently. Our family travels a lot right now since we are stationed right in the middle of Europe. Mango Homeschool Edition has been an amazing tool for me as an adult to help me feel more confident when we travel. Right now, I have quick trips planned to France, Belgium, Portugal, and Poland…. and I need German too in our day to day life. 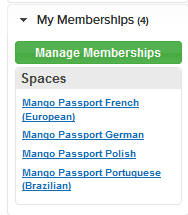 I love that with Mango, I can choose from any of the 60 languages, and do as many, or as few lessons at a time as I like. What I tend to do is log in a couple weeks before a trip, and do at the least the first couple lessons so I can learn the basic hello, goodbye and manners I need to survive when we travel. I can’t recommend this highly enough to military families in Europe like me who need to be able to communicate in a multitude of languages. 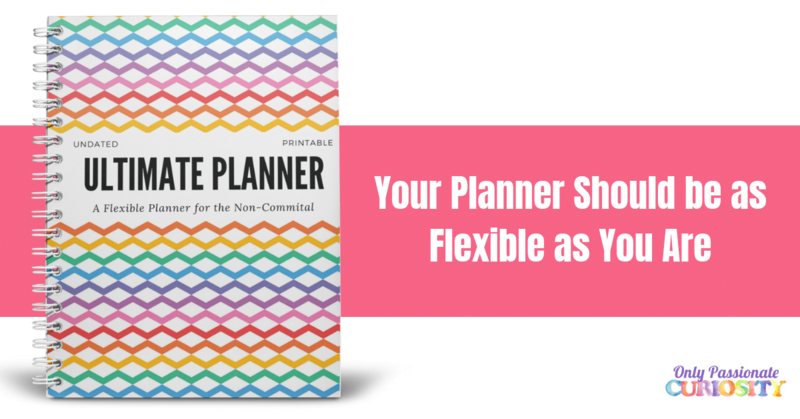 I wish we had discovered this a couple years ago when we first arrived so I could have been this prepared for all our trips. I also think this program would be great for middle and high school kids who are curious about languages and want to explore more than one. Each course is a different format, and some are more complete then others, so if you only want one, you may want to email customer service to see how in-depth the course you want to take is. For example, Portuguese has three “journeys” while Polish only has one to study, so there is a lot less information if you want to study Polish. For me, using many languages at once to make my daily life easier, all I really needed was the first journey. I used quite a few different languages, and added and left multiple language communities over the last 2 months. I have been impressed with every last one of them! This program is fantastic for middle and highschool students, and adult learners who want access to many languages for one fee. Membership gives you access to over 60 languages. Some of the languages have more content than others, including tests, quizzes, PDF files, and of course, the interactive online conversational lessons. Vocabulary is introduced both in writing, and is spoken aloud, and the learner responds and repeats the lesson as prompted. I recommend this for military families overseas (and anyone really living an expat life, especially in Europe! ), professionals who need to speak multiple languages, and middle and high school students learning languages (especially those who aren’t entirely sure which one they want to study in depth). 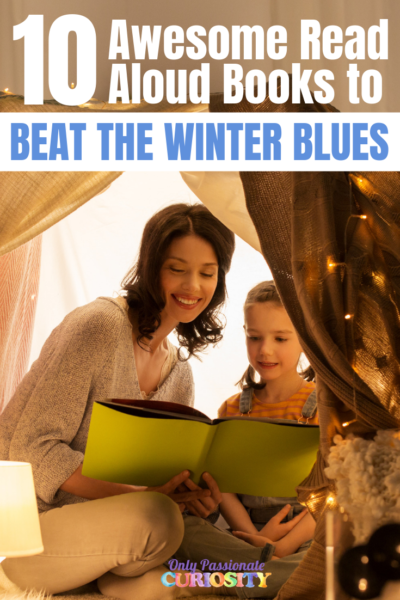 While recommended for all ages, I believe it is best for students older than 10. Over 6 people in your family needing to use Mango Homeschool Edition? No problem- just contact customer service to ask them about their group pricing.